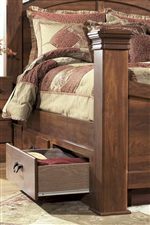 The replicated wood grain and warm brown finish offers a classic country style to this sleigh bed that is perfect for your master bedroom. 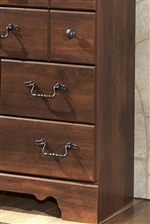 The beautiful cottage design is further enhanced for functionality with the underbed storage unit that adds two working drawers where you can keep clothing, linens, and accessories to the bottom of one side of the bed. This bed is available in queen size. 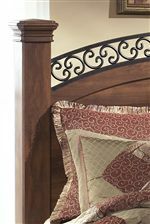 The Timberline Queen Sleigh Bed with Underbed Storage by Signature Design by Ashley at Del Sol Furniture in the Phoenix, Glendale, Tempe, Scottsdale, Avondale, Peoria, Goodyear, Litchfield, Arizona area. Product availability may vary. Contact us for the most current availability on this product. B258-54 Queen Sleigh Footboard 1 63" 7" 29"
B258-60 Underbed Storage 1 60" 18" 12"
B258-57 Queen Sleigh Headboard 1 63" 7" 54"